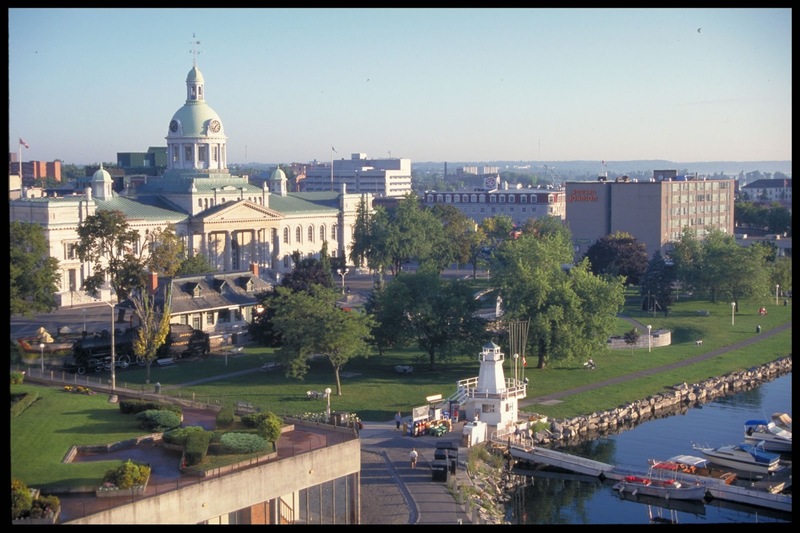 There are so many places to see in Canada that I have to admit Kingston, Ontario, was further down my list - well, until my daughter moved there in May 2013 to live with her boyfriend. Overnight, this scenic, historic city moved right to the top. When my husband was sent there to work for a week in August 2013, I tagged along and spent 5 days in a great hotel right downtown on the waterfront surrounded by historic buildings. The weather was sunny the whole time and my daughter even managed a few days off of work to take me touring. From food, to wine tasting, to the amazing historic architecture in the downtown area, to a musical historic tour by a costumed guide, it was a great visit covered in my earlier post - Exploring Kingston. Two years later, I was long past due for a visit, especially as they had moved from a basement suite into their first home with guest room. The first exciting part of this journey was the truly antique plane I took from Toronto to Kingston. It only sat 18 plus pilot and co-pilot. There were no overhead bins, no steward (co-pilot gave the hellos and took his seat) and no door between us and the cockpit. When we came in for a landing you could look forward out through the cockpit and see the landing strip lining up ahead. It felt like I had stepped into a a time warp back to the early years of flying. Even the steps folded down from the plane and only had ropes to hold onto instead of hand rails. This time around the weather wasn't as nice, but we still had an amazing time. I came early and stayed later so that I could try and help out. My daughter had just injured her knee playing ultimate and couldn't drive her car with stick shift and had to stay off her feet as much as possible. In addition to chauffeuring and a bit of touristing (sadly my favourite store, Earth to Spirit, closed in January after 16 years in business), my goal was to Feed and Freeze. They both work long hours, so cooking can be a burden during the week. I tried to make most meals while I was here and doubled them up so there was an extra meal or two to put in the freezer each time. By the time I left I had cooked about 10 extra meals. THE FOOD - Kingston offers an amazing number of eateries. We tried out several. 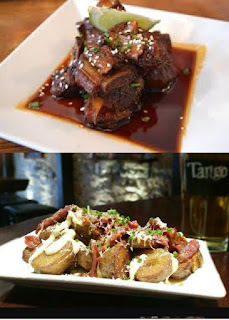 First on the list (just Danielle and I) was Tango Nuevos Tapas. 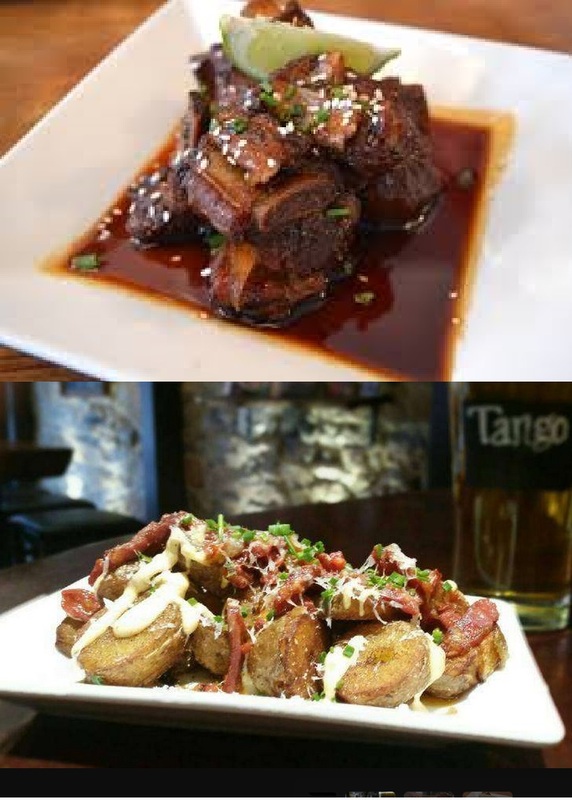 Tapas are one of my favourite meals as you get to try a variety of dishes. We chose four to share - Aguacates Fritos (crispy avocado fingers with Tomato-Orange relish), Chorizo Patata Bravas (Crispy potatoes with chorizo, roasted red pepper & aged Cheddar cheese, served with a spicy Piri Piri aioli), Portobello Mushroom V (roasted Portobello on flat bread with sun-dried tomato pesto, roasted cherry tomatoes, basil & a balsamic glaze, topped with goat cheese) and Asian Spare Ribs (Tender pork ribs with a ginger, soy, honey & anise glaze). The ambiance was welcoming, the food delicious and our friendly waiter gave us first rate service. Next was an outing with all four of us to Dianne's Fish Bar. This is a VERY popular place, so I would book a reservation to be safe. For drinks, two of us had wonderfully tart margaritas - another a minty mojito. But the final member of our party received the most impressive looking - a Caesar with a small lobster claw for decoration (meat included). This restaurant is famous for their battered fish or shrimp with chips, but only one us went that direction. 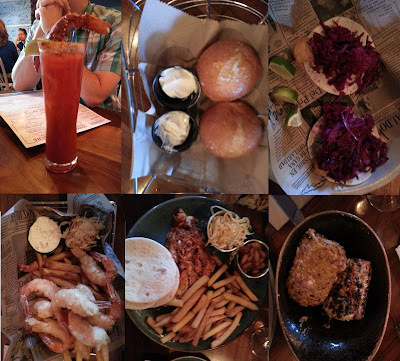 We had - Fish Tacos (two of us), to die for grilled Mexican Corn (on cob), tasty Vallarta Ceviche, Smokehouse Platter (meat, tortillas, slaw, beans and fries) and Jumbo Shrimp and Chips (with slaw). Again - great meal and wonderful service. Despite the fact we were stuffed, we walked across the street and joined the long, but fast-moving line to purchase a gelato at the uber popular Mia Gelato. YUM! Our last restaurant meal before Glen left was at a lovely place in Gananoque (about 30 minutes from Kingston) called Riva. From their website - "Riva brings together the flavors of two places we love dearly – Italy & the 1000 Islands. Inspired by the osterias of Italy, Riva is a modern day take on a traditional Italian tavern, paired with nautical elements that remind us of what we cherish most about The River." Decor included polished metal sideboards, ceiling and table lights created with heavy rope, a big manor style fireplace, warm and inviting bar and more. First we ordered a drink - three had white sangria and one a Minx (sambuca, fragoli liqueur, cranberry juice topped with limonata). The Minx was exceptional. 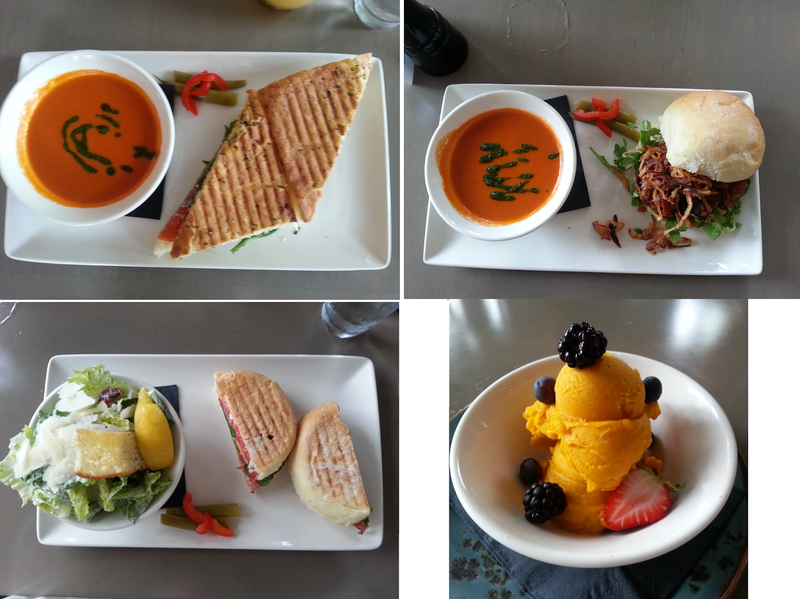 As it was lunch, we all had a sandwich paired with either a soup or salad. While we enjoyed lunch thoroughly, but in the end it was the ambiance that really made this stop special. THE SIGHTS - As I explored a lot last visit, we only checked out two new sites this time. While out on a scenic drive we stopped at the Kingston Mills Lockstation. This station on the Rideau Canal allows pleasure boats to move from a lower level to a higher level (or the reverse) by moving through 4 consecutive locks, each with a lift/drop of 3.6 meters. We were fortunate to be there as several boats were going through the locks in each direction. What makes this site truly interesting is the fact the locks have been left historically accurate, so opening and closing each gate is done by four attendants who work together turning the cranks at each of the locks - three working on one side and one on the other. They would finish with one and move up the the line to the next and do it all over again. I snapped a quick video showing three of them working on on side. There are also beautiful grassy lawns and picnic tables here if you want to relax for awhile and a side river you can fish in (permit needed). The other stop was at Canada's Penitentiary Museum. An odd choice, but it turned out to be very interesting. The rooms are filled with items from, and historical clippings about, the country's federal prisons. From wooden boards with colored pegs to record where prisoners were, to a sample of the old 29 inch cell alongside the newer larger one, to art work created by prisoners to the most amazing giant locks and keys - I was intrigued. My favorite displays showcased prisoner creativity - a hollow box created by stacking food trays used by one prisoner to escape (sorry the lighting wasn't better for picture); a small crossbow accurate to 40 feet fashioned from toothbrushes, kitchen tongs and other items; and even an electric mouse trap. There were books listing transgressions and punishments and even an old audio musical recording. The only room I disliked was the punishment room - especially the water bath seat that partially drowned the inmate. Barbaric. For my final day - Canada Day - three of us met Photographer/Stylist/Teacher Claire Bouvier for a get to know you lunch at Olivea, then walked up to the Kingston Olive Oil Company to pick out some new oil/vinegar combos to try (both covered in my previous post - link at top). Then at the end of the day, we wandered down to the waterfront for the traditional fireworks display (and one last gelato from Mia). So ends another great trip to Kingston. While this one wasn't as touristy as the last and there were a few more rainy days, the beauty of the area, the sense of history in the old buildings downtown and the lure of waterfront all made it a visit to remember. I'll be back.